The spotlight this issue is on Rudy and Joyce Polacek from Northern Arkansas. We began construction of their custom floor plan in November of 93, and they have done most of the finish work themselves. 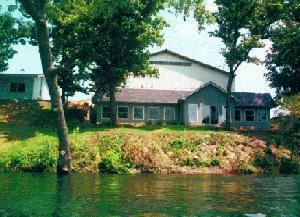 Their home faces South, overlooking the beautiful White River. It also has most of the East side open, including an entrance to the utility room. Rudy's future plans are to have a deck overlooking the river, and boat ramp, all constructed of recycled plastic. 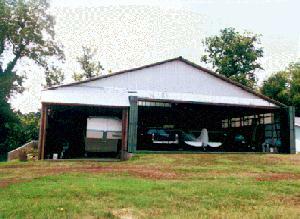 One of the more unique features of the Polaceks' home is the 40' x 60' airplane hangar/garage located on top of their home!! (Rudy owns and flies a 1951 Cessna 170.) They currently have a "dumb waiter" to serve between house and garage, and in the future Rudy & Joyce will have a 5' x 5' elevator, which they will design and build. "We love our home and would recommend it to anyone!" say the Polaceks, "Its great for retirement!!" On August 5th of last year, The Earth Sheltered Housing Industry; Indeed the energy consevation industry, lost one of its true pioneers. Andy Davis, founder of Davis Caves, died of cancer. He was 66 years old. 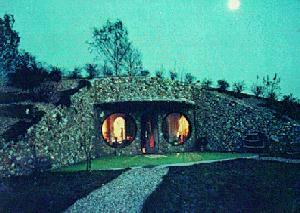 He died in his home, known worldwide as "The Cave," the home he and his wife Margaret built in 1976. More than any other person, Andy Davis was responsible for bringing the Earth Sheltered concept to the masses. The story of the building of the first Davis Cave Easth Home and of Andy was told worldwide, the news of his death spread just as far. This family has received letters and cards of sympathy from across the Country, from people reading or hearing of his death. As with any family business, there is a professional and personal loss that occurs when there is a death in the family. The cancer gave us several months to prepare, but I don't think you are really ready for the loss of a parent. Dad gave a lot of Love to all of his kids (There are nine of us). He taught me a lot of things...be honest, work hard, be fair to people, and help them every chance you can. Speaking of helping people, of the thousands and thousands of visitors that have toured "the cave" one couple touched Dad's heart as much as any, and made him very proud of his idea. As they were leaving, after realizing all of the money they would save on heating and cooling their new home, they turned to Dad and said: "Thank you Mr. Davis." Puzzled, Dad asked, "Why?" They replied, "now we can afford a new home AND a family, we didn't think we could. Thank you for helping us". That was one of Dad's favorite stories, and it gave him great satisfaction. I take pride in runnning this business. It makes me happy that every time a Davis Cave Easth Sheltered Home is built, somewhere up there Dad is looking down and smiling. He knows that he has helped someone. It's what he like doing the most. 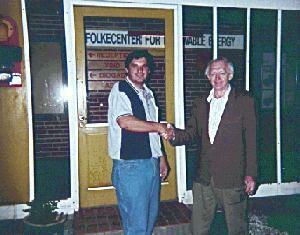 Davis Caves Making a "Global Impression"
Marty Davis (left) shakes hands with Preben Maegaard of the Folkecenter. Davis Caves president, Marty Davis, has returned from Hurup Thy, Denmarkwhere he was a consultant for a renewable energy training center under construction. Called "Folkecenter For Renewable Energy," the facility is a private venture between the Danish government and private industry. It specializes if developing and distributing information on wind and solar energy, bio-mass technology, geo-thermal energy and other areas of energy conservation. The Danish facility sports an earth sheltered design with passive solar heating and wind power supplying electicity. The European jaunt, meanwhile, may not be a one-time shot for Davis. He says government agencies and businesses in New Zealand, Hungary and Italy also have inquired about consulting services. 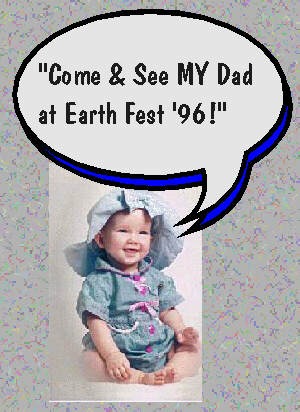 A.---In the early Eighties we installed Earth Tubes, in various homes throughout the Midwest. While the constant earth temperatures does help to condition the incoming air in the Summer and Winter, there were several problems we ran into after a few years. We noticed that there was a lot of humidity in the incoming air on hot summer days. There was a lot of condensation on the inside of the pipes, especially in the first 10 to 15 feet from the outside. Also, it is practically impossible to keep the dirt from settling the pipe, making it necessary to install fans to draw in and expel air. We recommend air-to-air heat exchanger for fresh air ventilation. They are about 85% efficient in transferring heat to incoming air, and they use very little energy to operate. There are several excellent brands on the market. Contact oour office for further details. A.---Yes, you can however it does add cost to the basic shell price. The least expensive way would be to have higher walls and a taller ceiling poured wherever you want the ceiling vaulted. You could then "frame in" the vaulted ceiling with wood, metal or plastic framing, and conventional sheetrock or plasterboard. It is also possible to have a loft area in the center part of the home (See the "Sheridan" floor plan of Earth Sheltered Designs). While this creates a slight energy loss, it is a very attractive option. Is June really the hottest month in Wisconsin? Someday I'd like to have a recumbent...Man, was that sweetcorn good! From what I heard, I'm very sorry I missed the band Saturday nite. This fair is fair is going to get bigger and better every year. Good to see some of our friends; Mr. & Mrs. David Knapp & Family...Marcel, always a pleasure, and special thanks (again) to John & Terry Thompson for helping us out (again), you guys are something else. HEY, RENEWABLES REALLY ARE READY!! It seemes that Earth Sheltered Homesowners report that, since living in their home, Santa Claus has become much more generous to their families at Christmas. Says Santa, "These are the easiest roofs in the world to land my sleigh on, and I am so grateful that I always leave a few extra gifts when I stop at an Earth Home! Just another advantage to our customers! Brian Sessa is build a modified "Monterey" (see Earth Sheltered Designs, page 37) this fall in Central Illinois. Brad & Beth Frank will be building their custom design this spring in East Central Illinois. Reverend Terry Williamson and his wife Becky will be building their custom design in Northern Michigan in summer of 1997. Mr. & Mrs. Bert Whistle will be building their custom design this spring here in Central Illinois. Dan & Becky Bowden will be building their custom design in Central Ohio this summer. helping the environment, send it to us.